Heat 2 tbsp of oil and fry fish, when it's golden brown remove from wok. Clean wok, heat 1 tbsp of oil and fry garlic and onion about 1 minute, add celery, dried chili and tomato, stir and fry 4 minutes. Add fish sauce, soy sauce, sugar and black pepper. 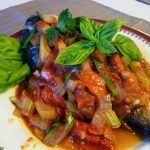 Pour tomato sauce over fish and garnish with spring onion, basil. Recipe by Paula. License: CC BY-SA 3.0.